The Bruno Mattei Show, Ep 16: "Rats: Night of Terror"
The Bruno Mattei Show returns with Bruno's epic futuristic tale, "Rats." The Bruno Mattei Show, Ep 14: "The Seven Magnificent Gladiators"
It's "Seven Samurai" and "The Magnificent Seven," Bruno style! Featuring Special Guest Ed Glaser! The Bruno Mattei Show, Ep 13: "Violence in a Women's Prison"
Not just a women's prison, but a violent one too! The Bruno Mattei Show, Ep 11: "Caligula and Messalina"
Special Guest Jillian Zurawski returns to talk the first of Bruno's "Caligula" knock offs. The Bruno Mattei Show, Ep 10: "The Other Hell"
The crew sit through that other nunsploitation film "The Other Hell." There's no way this could be bad. Dig the new episode Illustration by Oliver Lee Arce. The Bruno Mattei Show, Ep 9: "Hell of the Living Dead"
Special guest Ed Glaser stops by to talk Bruno's zombie 3rd World epic "Hell of the Living Dead"! The Bruno Mattei Show, Ep 8: "The True Story of the Nun of Monza"
Jerrid Foiles comes out from behind the camera to join the crew on some Bruno Mattei nunsploitation. 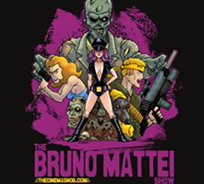 The Bruno Mattei Show, Ep 7: "Perversione Del Sesso"
It's "The Bruno Mattei Show"! Now with better picture quality AND better sound! In this episode, the crew rejoices as "Perversione Del Sesso" marks the FINAL Mondo related movie in Bruno's filmography.